Hillsborough County's record of accomplishment at managing and planning big projects and the associated funding are sketchy at best. 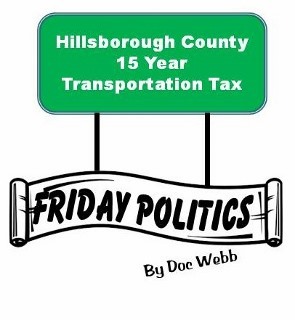 Amid a chorus of negatives, the backers of the Hillsborough County sales tax for transportation have once again managed to get the idea of a sales tax referendum on the County Commission agenda. In a desperation move to get some tax money flowing for those who depend on it for their livelihood the Hillsborough County Commission will consider a half-cent sales tax for 15 years. One commissioner has even asked County staff to prepare information on five and ten-year concepts. This idea is so bad and so stupid it is difficult to know where to start. To begin with, Mayor Buckhorn was against the 15-year option at the last session when the tax was voted down. His main reason is with the period of the tax less than 30 years it makes using the tax revenue for bonding (borrowing more money) all but impossible. But let's be a bit more practical. Setting up a short-duration tax that flows into an undefined series of potential projects is a consultant's absolute dream. The likes of Parsons Brinkerhoff, Beth Laythem and host of other local and national law firms, consultants and planners must be salivating at the very thought of this thing getting to the ballot. County Commissioners desperate to hang something positive on their political resumes regarding transportation would be well advised to run from this like they would run from a burning building. Nothing could be worse for the fate of public transportation, than a poorly planned half-baked tax initiative that will become a poster child for every form of poor planning and graft and corruption one could imagine. There is no way to sell a boondoggle like this to the voters. All the politicians are saying are we can't say NO to the special interests who want their fingers in a new transportation tax. Should the Hillsborough County Commission decide to lateral the ball and place this referendum on the Ballot every voter in Hillsborough County should go to the poles and vote NO. The Hillsborough commissioners are worse than the clowns in Pinellas! At least there was a Greenlight plan - a very bad plan, but nevertheless a plan. They don't want a tax hike, they want to get re-elected and that means they need money. The best way for politicians to get money is to funnel tax money to their donors, the big companies that eventually get our tax money. So here we go again, having to vote on a non-plan that will cost taxpayers about $2 BILLION over 15 years and, if it passes (voters will be inundated with reasons why they should vote for it, paid for of course by the big companies), then there will be 15 years of taxes followed by another 15 or even 30 years of even more taxes to clean up the mess.